A round in advance, it is clear that the 5-time World Champion Viswanathan Anand is the winner of Candidates tournament leading with 8/13 points, +1.5 points ahead. Karpos Open Chess Tournament will take place in Skopje, Macedonia, 29 March - 5 April 2014. It is organised by the municipality of Karpos in Skopje, in collaboration with Chess Club Gambit Asseco SEE. Time control: 90 minutes for 40 moves and 30 minutes till the end of the game with 30 sec. for a move, timed from the first move. GM Alexander DELCHEV who commented Candidates games for ChessBomb is taking part at Karpos Open. We wish him good luck! Today was the 12th round of Candidates 2014. Topalov defeated Svidler, and the other games finished in a draw. The only competition for Anand is Aronian. 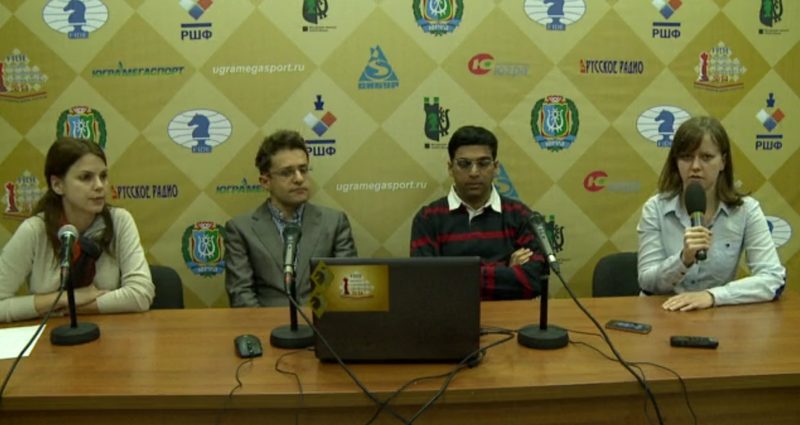 Watch LIVE GM Delchev's commentary of Kramnik-Anand game. The tenth round of Candidates 2014 finished with three draws and Svidler's win over Kramnik. Anand is still in the lead with 6.5/10 points, and it becomes very likely to see Anand and Carlsen at the World Championship in November. The only win in the eight round of Candidates 2014 is that of Karjakin (blacks) over Svidler. All other games finished in draws, most notably the draw between Aronian and Anand in only 19 moves. Review the games with analysis at ChessBomb: Candidates Tournament 2014. After the seventh round of Candidates 2014 Aronian caught up with Anand in the leading position with 4.5/7 points. After the fifth round of Candidates 2014 with three draws and a win of Svidler over Topalov, Anand is still in the lead with 3.5/5 points. Despite losing in the first round undeservedly to Anand (have a look what black missed on move 13. ), Aronian did not lose his confidence and the fighting spirit. Soon he came back with the entertaining combination against Mamedyarov. Yesterday he managed to beat a well performing up to this point Svidler. After that Aronian caught up with Kramnik on +1. The game against Kramnik is going to decide who will be the main pursuer of Anand who is meeting Andrejkin. But today Aronian unfortunately has black pieces and in his last tree black games against Kramnik he had hard times. Kramnik proved to be a tough examinator playing tree different first moves. In his game from a Tal memorial he opted for 1.e4 and the modest line of the Scotch games occured. Nevertheless, soon Aronian had severe difficulties but somehow he managed to escape (Cramnik-Aronian, Tal Memorial 2012, round 4). In the decisive match between Russian and Armenian team at the Istanbul Olympiad, Kramink opened with his main 1.d4. Soon in an only slightly worse position Aronian committed an error and was immediately punished in a highly instructive way - look (Kramnik-Aronian, Chess Olympiad 2012, round 6). In his game from 2013 from London Candidates tournament Aronian again had a big problems after 1.Nf3 d5 2.g3 but finally he passed the exam (Kramnik-Aronian, Candidates 2013). You can see that Kramnik avoids the theoretical dispute and enters in a modest side lines, which consists however a little venom. Nowadays this is the unpleasant treatment of the first move advantage. Especially when the opponent has a narrow repertoire. Then you can even guess what position would happen and to prepare some slight improvement. This will bring at least an advantage in time because the opponent has to solve the problems over the board. After Svidler missed his chance against Kramnik, yesterday he was punished by Aronian. Has he lost his confidence after that? Or will he take revenge on Topalov, who is still looking for his first victory? The fight between them is always very tense. In 2013 both games where Svidler had white pieces finished draw. In a 21-category Norway chess tournament Svidler opened with 1.e4 but escaped from a theoretical battle in Sicilian with the modest Bb5+. Only a couple of weeks later they played in Thessaloniki Fide GP where the opening was a classical Queen gambit declined. This time Svidler entered in a theoretical dispute and after an exchange combination managed to achieve a better endgame. Shortly afterwards he committed a slight error and the draw again was inevitable. Round 4 of the Chess Candidates Tournament 2014 finished with two draws and two wins for white. Anand is still in the lead with 3.0/4 points, followed by Aronian and Kramnik with 2.5 points each. Today's game Anand-Kramnik is going to be a tough exam for Kramnik. It seems that in 2008 in his preparation for the championship match between them Anand managed to find the key to him. I found out that Kramnik never won with black against Anand in a classical game. The margin between them is the overwhelming +6 for Anand who is now in a great shape and is a sole leader in the tournament with 2.5/3 Kramnik is still in his footsteps with 2/3 after the miraculous escape against Svidler in the previous round. What first move will choose Anand for this important game? A win today will seriously increase his chances to meet Carlsen again in a match revenge. Kramnik had problems equalizing against Svidler so Anand could try 1.c4 because Kramink probably did not have time to repair. Anand used often this trick in previous tournaments. But the most probable first move is 1.e4. In Zurich 2013 he defeated Kramnik in his beloved Berlin (Anand-Kramnik, Zurich 2013, round 6) and in Anand-Kramnik, Corus, 2010 Kramnik did not succeed - in his other drawing speciality - Berlin defence. Besides it brought him victory in the first round against Aronian - (Anand-Aronian, Candidates 2014, round 1). GM Alexander Delchev (FIDE rating 2638) has kindly agreed to provide for ChessBomb analyses of selected games from the Candidates Tournament 2014. Follow Candidates 2014 at ChessBomb for more commented games by GM Alexander Delchev. The first round of the Chess Candidates Tournament 2014 finished with one win of Anand over Aronian, and three draws.